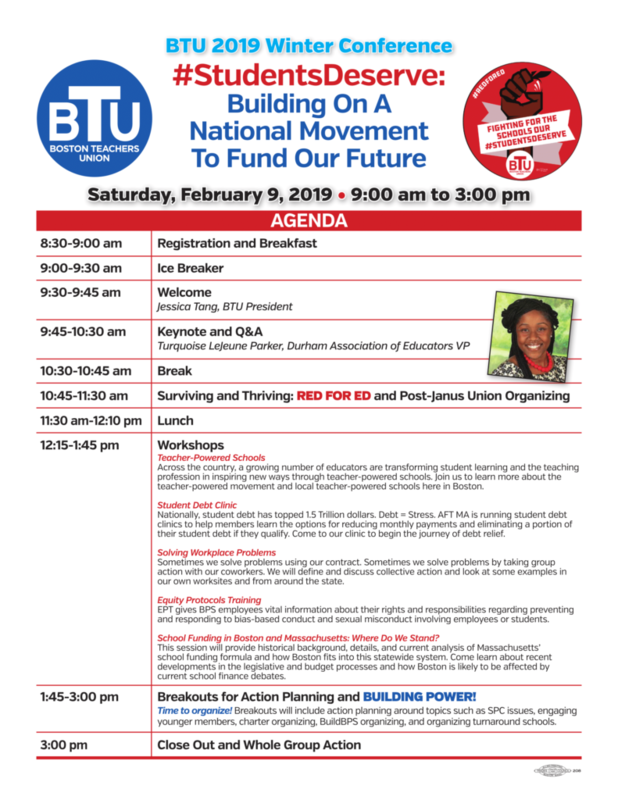 Please plan to join us from 8:30 AM to 3 PM on Saturday, February 9 for the 5th Annual Winter Conference, open to all Building Reps and ALL interested BTU members. Download a flyer for posting. This conference will feature workshops on many interesting topics. Schools are encouraged to attend as teams. Breakfast and registration will begin at 8 AM. Lunch will be served, and childcare will be provided. Register using the form below! Teacher-Powered Schools: Across the country, a growing number of educators are transforming student learning and the teaching profession in inspiring new ways through teacher powered schools. 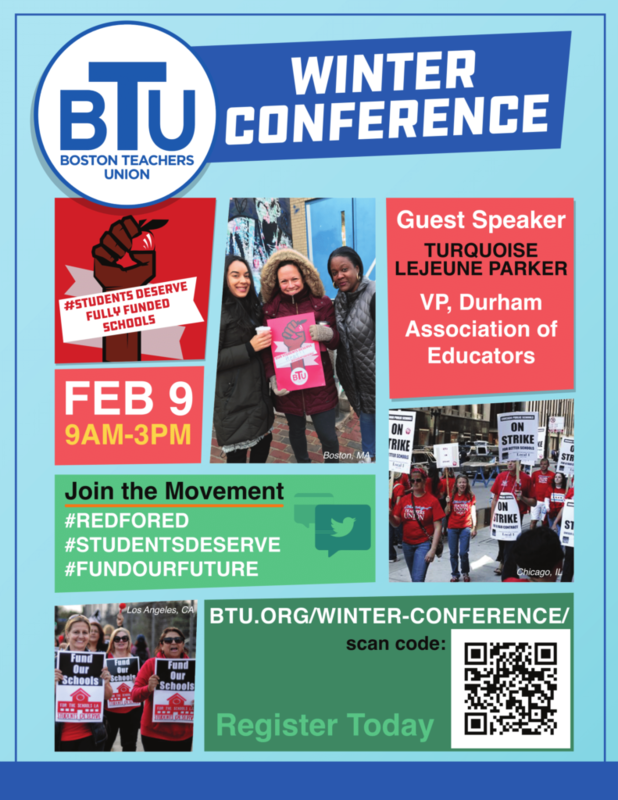 Join us to learn more about the teacher-powered movement and local teacher-powered schools here in Boston. Student Debt Clinic: Nationally, student debt has topped 1.5 Trillion dollars. Debt = Stress. AFT MA is running student debt clinics to help members learn the options for reducing monthly payments and eliminating a portion of their student debt if they qualify. Come to our clinic to begin the journey of debt relief. Solving Workplace Problems: Come learn about different ways we can solve problems that arise in our workplaces. Sometimes we solve problems using our contract. Sometimes we solve problems by taking group action with our coworkers. We will define and discuss collective action and look at some examples in our own worksites and from around the state. And we will come up with some strategies and tools that can help us determine when and where to use collective action most effectively. Equity Protocols Training: EPT gives BPS employees vital information about their rights and responsibilities regarding preventing and responding to bias-based conduct and sexual misconduct involving employees or students. School Funding in Boston and Massachusetts: Where Do We Stand? This session will provide historical background, details, and current analysis of Massachusetts’ school funding formula (also known as Chapter 70) and how Boston fits into this statewide system. Participants will be provided information to support greater knowledge of the main components of the funding formula. This will include specific details on recent developments in the legislative and budget processes and how Boston is likely to be affected by current school finance debates. 1:45-3 PM: Breakouts for Action Planning and BUILDING POWER! Time to organize! Breakouts will include action planning around topics such as SPC issues, engaging younger members, charter organizing, BuildBPS organizing, and organizing turnaround schools. Are you a BPS parent? What school(s) do your child(ren) attend? Are you part of any civic, community, cultural or faith-based groups?